SpendInsight quickly provides the information required to either match the products that you purchase at item level, or to classify those items that could not be matched to a sufficient level of detail to calculate the carbon footprint. This is then combined with the publicly verified information for products and industries to build up an organisations environmental impact from the bottom up. As data improves over time, the accuracy of the analysis improves, however the baseline data is maintained so that an organisation has an accurate starting point. 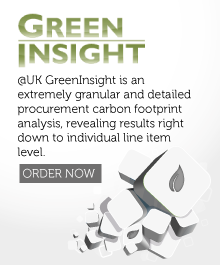 cloudBuy GreenInsight is an extremely granular and detailed procurement carbon footprint analysis, revealing results right down to individual line item level. Powered by artificial intelligence technology (the outcome of a three-year knowledge transfer partnership with cloudBuy, The University of Reading and Goldsmiths College, London and our commercial partnership with the Centre for Sustainable Accounting), we’ve already calculated carbon footprints for over popular 4 million items and enabled large organisations such as the NHS Sustainable Development Unit to define where their efforts on carbon reduction should be concentrated. The results are presented in an easy-to-manipulate Excel workbook application, so you’ll save all the leg-work and guess-work and be able to move straight onto putting your reduction plan into action. Next steps: Want to know more?